New Yorkers have a special awareness of the cruel realities of ALS, because of Lou Gehrig. For example, in pre-bucket challenge days, the New York ALS chapter launched successful give $4 drives, in honor of his retired number. Sadly, many champion boxers have also succumbed to the neurological disorder. Herbert Stamm was a serious contender during the dark days of the GDR, but he never raised a belt over his head. He took as many blows as any champ, but his massively bad karma will make matters even worse. 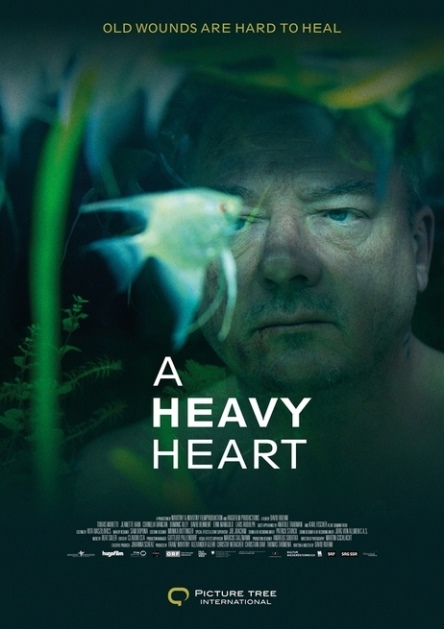 Stamm faces a slow but inevitable final count in Thomas Stuber’s A Heavy Heart (trailer here), which screens during the 2015 Toronto International Film Festival. Stamm has always relied on his brawn. Even in his less than golden years, he scrapes by gigging as loan collector and a bouncer. His only hope for the future is Eddy, the talented young fighter he trains. He even feels a bit like a surrogate father to the scrappy up-and-comer. Stamm has an actual genetically-verifiable daughter, but they have not had a relationship for years. He did not necessarily intend to abscond from Sandra’s life. Those prisons tattoos did not happen spontaneously, after all. Stamm was just too embarrassed or too self-absorbed to reconnect. He will soon regret that quite bitterly. It starts with a simple slip in the shower and a bit of muscle cramping, but it is not long he gets the grimly fatal diagnosis. Suddenly, he cannot afford to push away the emotionally needy Marlene, whom he had been transparently using for drunken one night stands. He also dearly wishes to reconcile with Sandra, but her resentment runs deep. Soon, Stamm will only find comradery and respect from his old tattoo artist buddy, but their carousing becomes rather poignant. So yeah, good times at the movies. Regardless, if you want to see master class in precise-controlled screen acting, Peter Kurth’s lead performance delivers with quiet power. Kurth, who was rather charming as the down-to-earth but utterly befuddled title character in Schmitke, put considerable weight on his physical frame and his psyche. You can see both slowly disintegrate over the course of the film. It is excellent work that never gets too showy or Streepish. It is Kurth’s film, nearly to the exclusion of all others, but Edin Hasanovic and Udo Kroschwald add real grit and character as Eddy and Bodo the loan shark, respectively. Stuber occasionally overindulges in unsubtle manipulations, but the gravitas of Kurth’s performance helps muscle the film through such sequences. It is an unusually unsentimental star turn in a film that compulsively discourages false hope. Recommended as a fine vehicle for an actor’s actor, A Heavy Heart screens again tomorrow (9/14) and Friday (9/18), as part of this year’s TIFF.